Over the past 17 years Lifestart Foundation has helped over a thousand individuals and families. It is always lovely to receive a heartfelt letter of gratitude. Meet Hai, the very proud and grateful owner of a new wheelchair generously donated by a kind and generous Lifestart Foundation supporter. Hai lives at the homeless shelter where Lifestart Foundation has provided daily treatment and care to many residents. 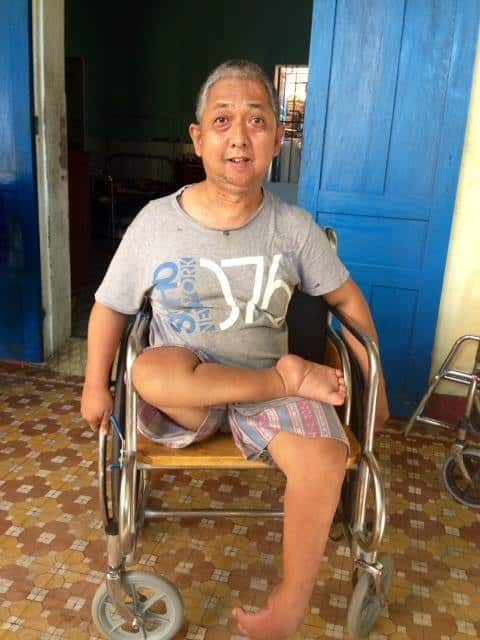 This new wheelchair will provide Hai with mobility as he cannot walk. Introducing the beautiful and vivacious Hang – An Agent Orange Survivor. This is Part 1 of Hang’s inspirational story. 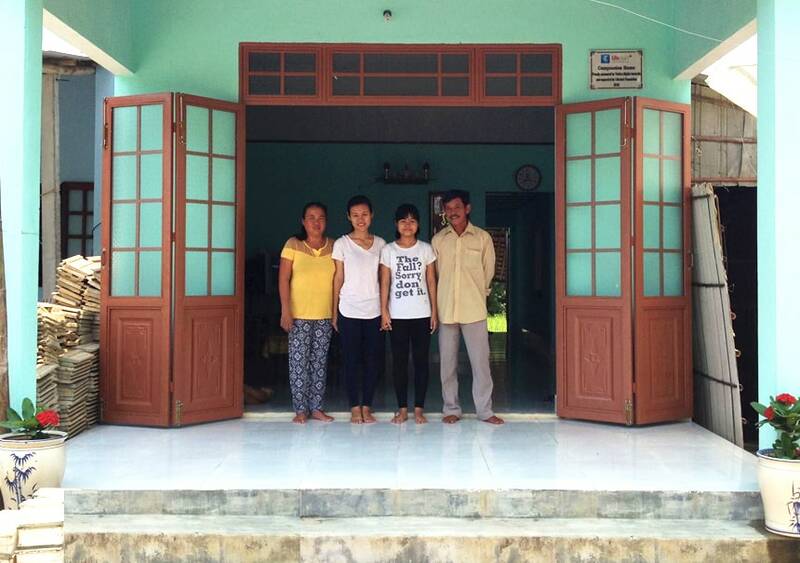 Hằng comes from a family of six, including her grandfather, dad, mum and two younger brothers. Both of her parents are farmers and her youngest brother has an intellectual disability and is unable to attend school. They live in a poor countryside area in Central Vietnam. Hằng belongs to the 3rd generation of Vietnamese affected by Agent Orange. She was born with a severe disability which included no right leg and a disability with her hands. She had her first leg surgery at 8 years of age and has been wearing a leg prosthesis since she was 12 years old. Hằng has always been determined to get an education and never let her disability and challenges get in the way of her success. In High School, Hằng was quite lonely and did not have many friends. However that has all changed now. Hằng is now a 3rd year student at Passerelles Numeriques Vietnam, studying IT. She was awarded a full 3 year scholarship from 2016 to 2019 and she will be graduating in August 2019. Since her admission in PNV, Hằng has been an outstanding student; including her academic results, her attitude, her motivation and character. She is extremely hard-working and always has a positive mindset. She is very supportive with her classmates. Her physical and mental strength despite her disability is an example for all of us. Hằng was introduced to Lifestart Foundation in 2016 as she needed transportation to get to her studies and to be able to live more independently. LSF supplied her with a specially modified 3 wheeled electric scooter which made it easier for her to navigate her way around Da Nang safely and with new found confidence. She lives at a dormitory and shares her room with six other girls who are very supportive. Despite the difficulty and pain she has lived with, she never asked for help to climb stairs to her room or to get to her studies. Before she received the electric scooter, her roommates used to take her on their bicycle to get her to class or to join outside activities. She participates in as many extra-curricular activities as possible such as board games, activities at the beach and yoga. If you like and support what Lifestart Foundation is doing across so many project areas, please consider a donation, joining our monthly Member Club or running a fundraising event for us. Xuyen is one of the craftswomen from the Lifestart Foundation Workshop (LSFW) and the creator behind the recycled paper coasters, bracelets and bowls, as well as the knitted egg hats. 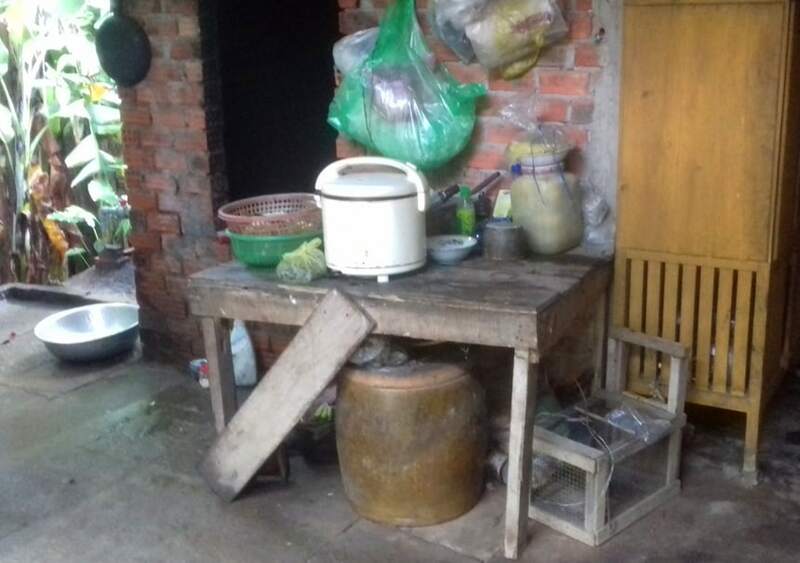 Xuyen is part of LSFW’s initiative to train Vietnamese people with disabilities with the skills to become self-sufficient. 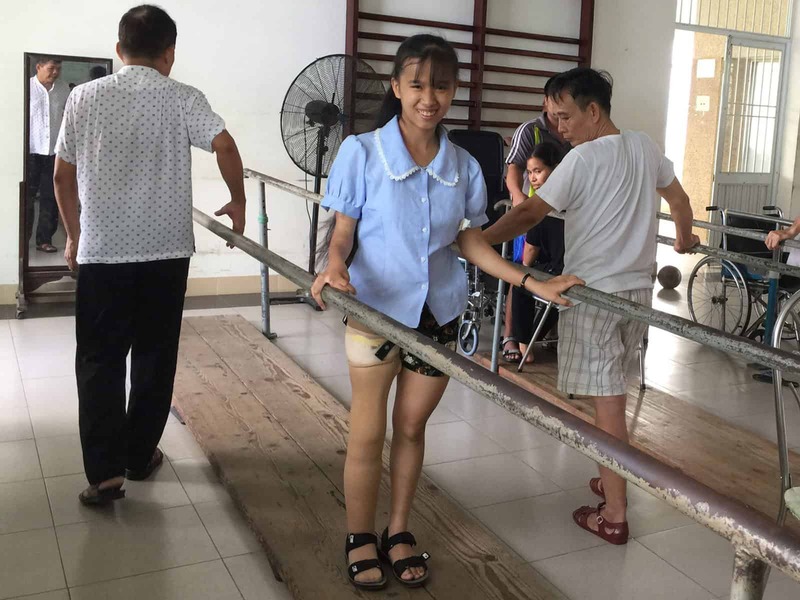 At the age of 5, Xuyen’s right leg became paralyzed affecting her mobility. When Xuyen joined LSF in 2009, she received a 3-wheel motorbike and began training as a workshop member. Xuyen was an exceptionally fast learner. She was able to make the products simply by looking at a photo and had no need for a pattern. When asked if she will learn any more products, Xuyen said that she is satisfied with her pieces for the time being. 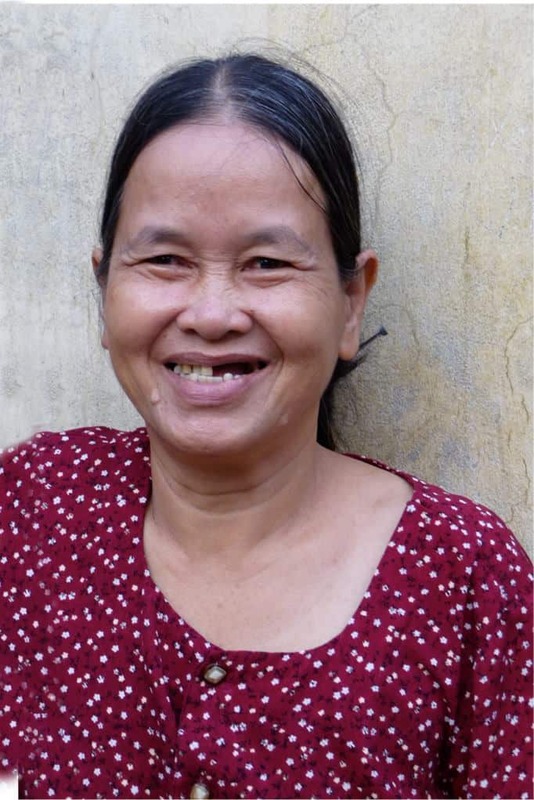 Xuyen plans to work at LSF for as long as she physically possible, but her eye sight is currently failing. She recently lost vision in her right eye and her operation only complicated matters. 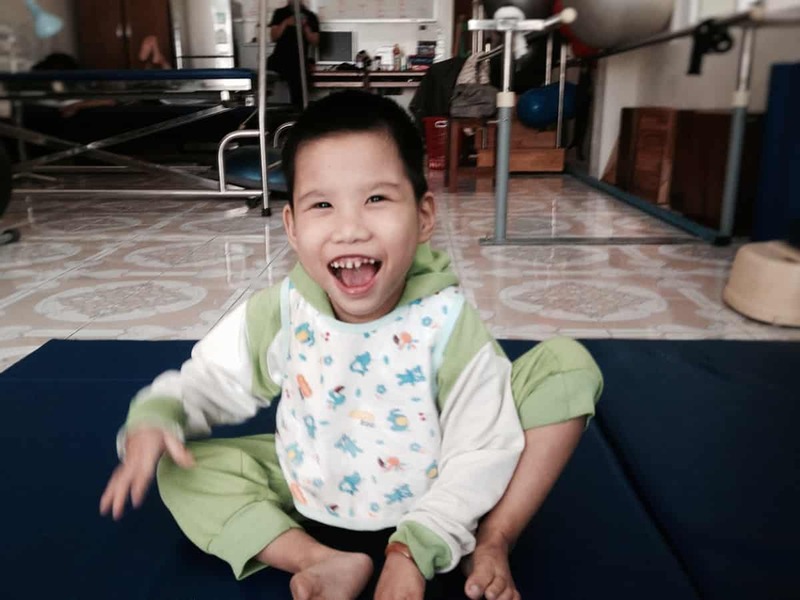 But Xuyen’s sense of humor and smile keeps us entertained every day at LSFW. When not working, Xuyen’s favorite pastime is spending time at home with her little grandson and her family. Xuyen lives with her son, his wife and grandson. Xuyen adopted her son, Binh, after he was abandoned at a local hospital by his mother. Xuyen is hoping for more grandchildren in the near future! 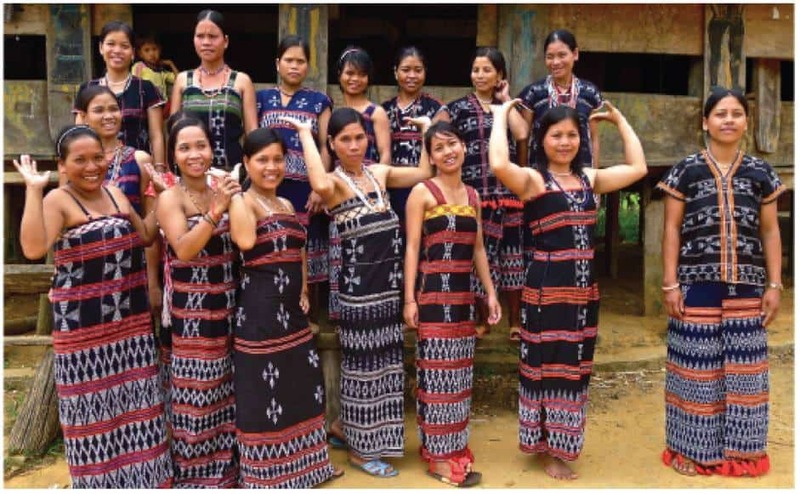 Dhroong village is home to many exceptionally skilled weavers. 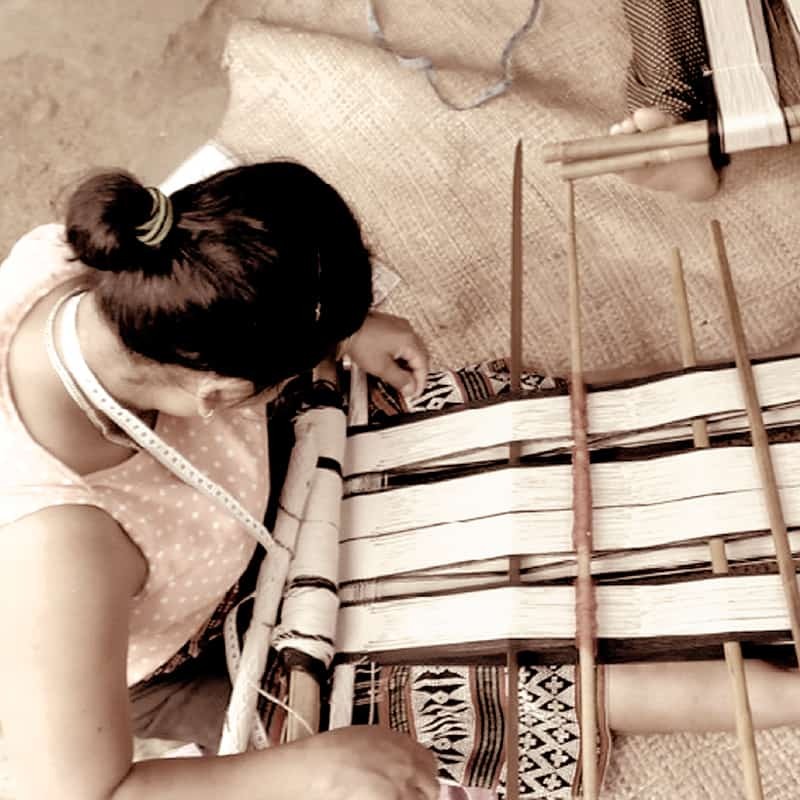 Girls learn the art of weaving at the age of 7 from their mothers. When not tending to their crops, weaving is also a reason for CoTu women to gather and socialize. The CoTu Yaya business group was established offering ethnic CoTu fabrics, clothing and other products for purchase. Dhroong women hope their products will generate extra income so that they can provide education and other opportunities for their children and community. Your support will keep CoTu traditional crafts alive and help CoTu women realize their dreams. 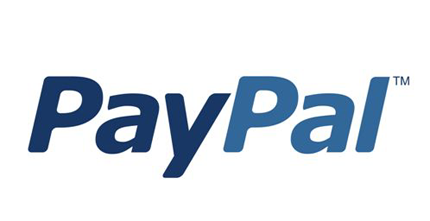 All profits from purchases stay in the village. CoTu weavers harmoniously maneuver their wood and bamboo frame with their body movements. Seated with their back holding the end of vertical yarns, the weaver pushes the other end of the yarns with their legs, changing tensions to allow horizontal yarns to criss-cross the other. Thao was born in 1993 in Kon Tum and she has five members in her family. Unfortunately, four of the 5 family members, including her mother, her two younger brothers and Thao suffer from brittle bone disease. Thao’s father is the main breadwinner for the family. He is a farmer and also works as a labourer. Thao’s disease has caused her to break her leg three times but she considers herself to be lucky as she is still able to stand on her own two feet. She has completed Year 12 unlike her siblings. 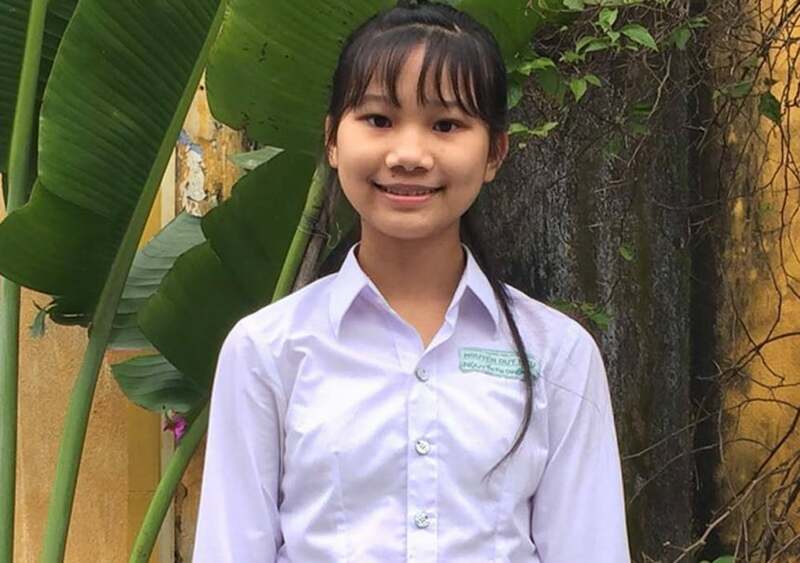 Thao’s brothers are not as lucky as her as after they broke their legs for the 3rd time, they became wheelchair bound and had to stop their study at the end of year 9. Thao has a dream of becoming an artist, however, her family situation does not allow her to pursue her passion at this stage. 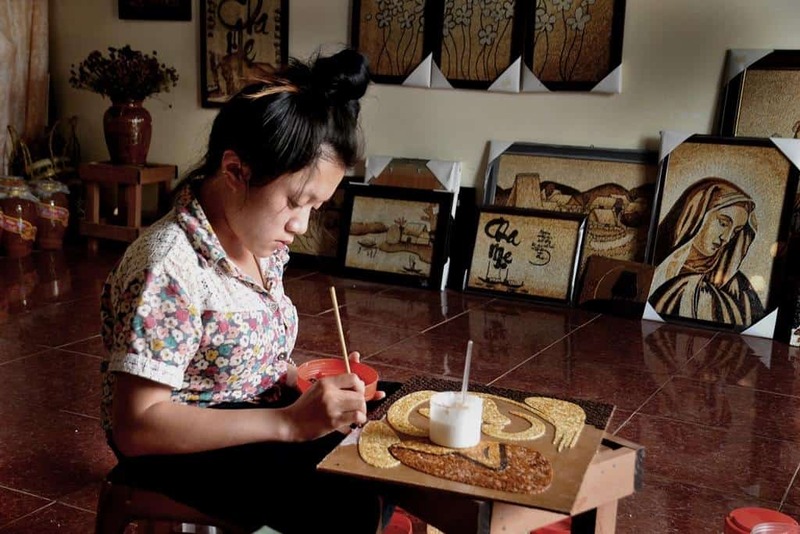 Being a big sister and trying her best to cope with the difficulties her family faces, Thao decided to go to classes to learn how to create Rice Art. She embarked on Rice Art classes in the hope that she could learn something that would create an income. Thao has studied Rice Art for three years and is now very proficient with this new skill. She earns a modest income which helps her to support her father with the medical treatment for her mum and her younger brothers. 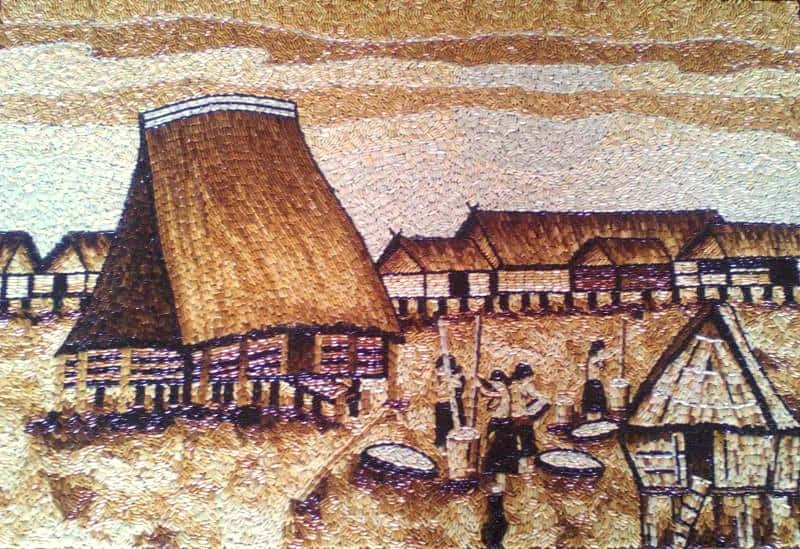 Rice Art is quite a unique hand made form of art from the Central Highlands of Vietnam. Lifestart Foundation is very proud to be collaborating and supporting the talented Rice Art artisans, including our featured artisan Thao. Each hand made Rice Art piece is painstakingly made over many days, the images usually depict very typical and beautiful Vietnamese scenes and images. The best rice is chosen. It is then dried and roasted at a low heat for many hours to get the color just right. The longer you roast the rice the darker the color you will get. Good wood is chosen for the base and dried in the sun for a few days. The next step is to draw the picture onto the wood then coat the wood with a water proof coating. Place the rice on the wooden base piece by piece and then then dry the art in the sun for 2 days. Spray the painting with a special spray. Frame the painting and seal. Rice Art will last from 15 to 20 years. With your support the proceeds from the sales of the Rice Art products will help the artisans to become self sufficient. If you are looking for something truly unique as a memento from Vietnam, then please support talented artisans like Thao. Meet Dao. She started out a healthy child, but when she was 2 years of old she suffered a number of episodes resulting in deterioration in movement, reflex and communication. Her mother provides full-time care and her father, a chef earns just $100 per month. With such a small budget the family has been unable to afford medical testing. It’s likely Dao has suffered a number of strokes and is at risk of more in the future. Her family are unable to afford educational toys or adaptive equipment so Dao has nothing at home to help her develop whilst any help her family can provide is frustratingly limited. The Lifestart Foundation’s Free Disability Community Centre has adapted to accommodate Dao, seeing her 3 times a week. Simple things could make a huge difference to her progress. A wooden table and chair (cost $10) will help her sit, improve balance, strengthening muscles and much more. A range of educational toys (cost $100) to use whilst sitting at her table will help improve coordination, the use of her hands, balance, aid learning and most importantly provide lots of fun! 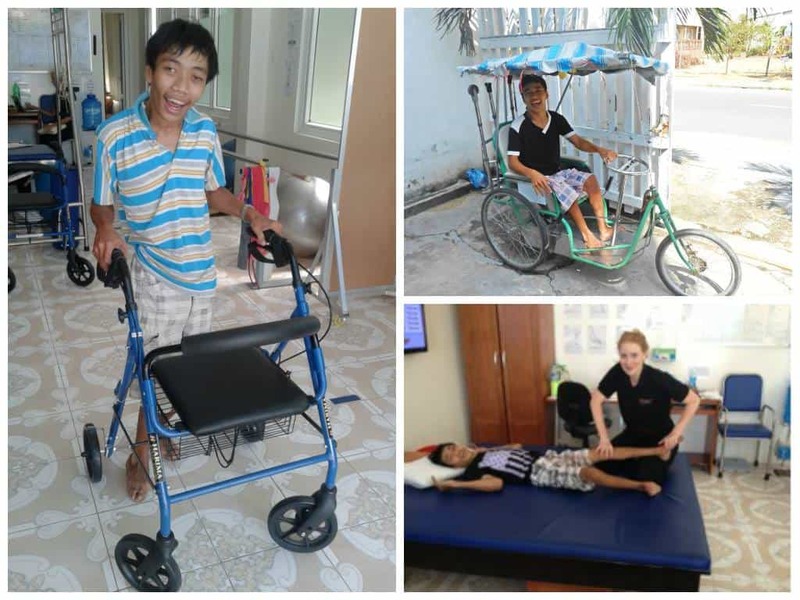 The Lifestart Foundation hopes to provide these things with your help alongside a ‘custom made walker’ (cost $180) for Dao to use to move around on her own whilst strengthening her legs and getting used to moving them in certain ways, helping her prepare to hopefully walk again. Here is a photo of Sy, the amazing young man we told you about yesterday. You can see his wonderful smile, with a photo of his brand new walker, his personalized push-me-pull-me, and a photo of his work with a past volunteer, physiotherapist Emma! Thanks to the donations we received from many of our generous supporters, we were able to help many families who were affected by Typhoon Damrey and floods that impacted Central Vietnam at the end of 2017.